Special deal: Admission is Buy One, Get One Free! After the Hollywood film and its numerous awards, the words "the social network" are firmly in our vocabulary. Almost weekly news stories herald the loss of privacy due to the proliferation of such social networks. Even US government secrets went public in the form of WikiLeaks! All this raises the question: have we as a culture become ambiently intimate with each other? This program will explore ways in which those intimate moments make their way into the public sphere. 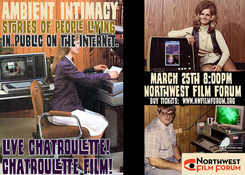 Ambient Intimacy presents a selection of the web's most notoriously intimate moments; blogger moms, live interactive Facebook profile construction game, chat roulette on the big screen, and generally a show-and-tell unlike anything you’ve experienced in a theater before. Be a part of it! Bring a friend for free! All tickets (purchased in advance or at the door) will be honored as admission for two people.